I have a headache. It’s from being inside almost all day, with construction going on next door. Noisy, noisy construction. In case I haven’t mentioned it, there use to be a three story Best Western in the lot next to us. But it was torn down before we moved here. Since then they have been building a condo development. It is suppose to be 13 stories tall (maximum allowed). After a year and half of work, they have four or five levels kind of built. And that’s working six days a week. I think part of the reason it is taking so long is because they don’t actually get to use all their employees. Two to three employees are regularly stationed in my buildings parking lot. They sweep the debris that their construction generates. 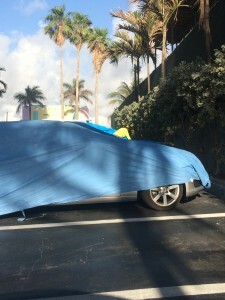 They cover and uncover our cars as we come and go to protect from dust. That’s one of their employees in yellow, covering the car. 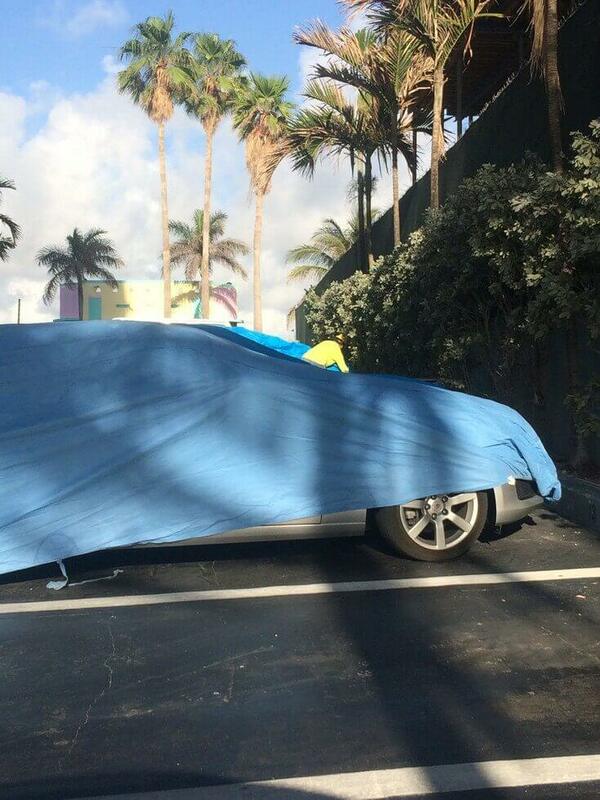 When they run out of covers and a car gets dusty, if you complain enough they will wash your car. Now, they have never actually washed mine (despite the fact that it desperately needs to be) but I’ve seen them washing some of the nicer, more expensive cars. Which is why I’m assuming those people complained. Well, that and the fact that I saw the guy who drives a Lexus going crazy on five of their employees one day when I went to leave and when I came back his car was being washed by those employees. And then two nice cars after his got washed too. They just told me to park else where that day. Which is easier said then done, as parking here in Miami is premium. Which is another reason why in 18 months they have only gotten roughly four levels built. They spent months having to jack hammer out the ground, in order to make an underground parking garage. 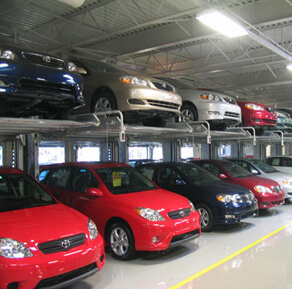 Which I have been told is going to have lifts to stack cars, for optimal parking. The new hotel here has it too. It’s cool looking, and necessary, but you definitely aren’t getting into your car and driving anywhere quickly. I’m imagining this has to add at least five minutes to your commute time when you are the car on top. But then again, the rumors are that these condos are starting at 4 million dollars and will have a monthly maintenance fee of $2500. For the record, that maintenance fee more then my rent. So at those prices, I’m imagining they get to pick up the phone and call down for a car. Like you see in the movies. “Have the car ready for me in 15 minutes.” I wonder if they will fill it with gas too? How awesome would it be to never go to a gas station again? Unless you were just running in to get a slurpee. And funyons. Anyway. While having a headache is the downside of being inside all day, the upside is that I had time to make something that requires more cooking time then my schedule normally allows. 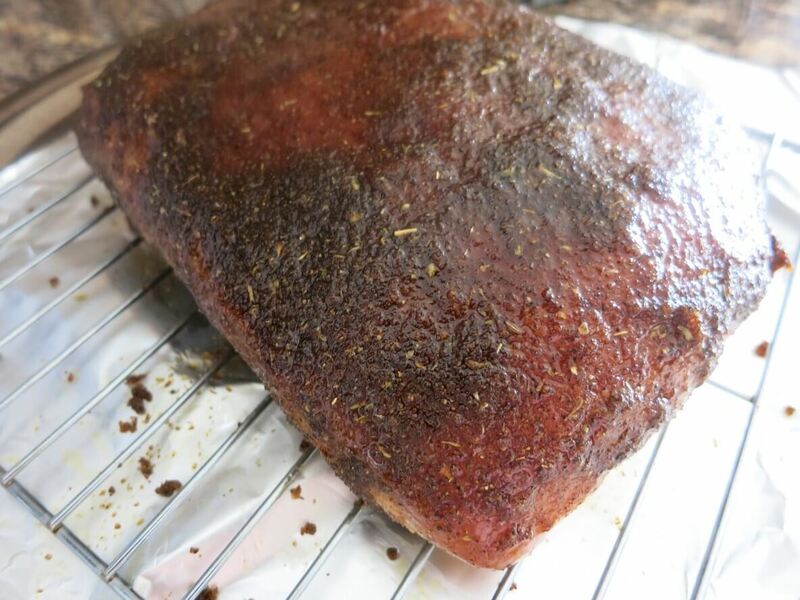 So I decided to make a recipe I found on Barefeet In The Kitchen, for Mexican Spiced Rubbed Pork Roast. Except I used pork loin, cause that’s what was in my freezer. Otherwise I stuck to the recipe, as it was all pantry staples. I even had the smoked paprika! I actually normally opt to use regular paprika over smoked, as the smoked flavor can be to much for me. But since this recipe calls for a total of 10 spices and seasonings, I felt confident the smoked paprika wouldn’t dominate once they were all combined into the rub. And I was right. 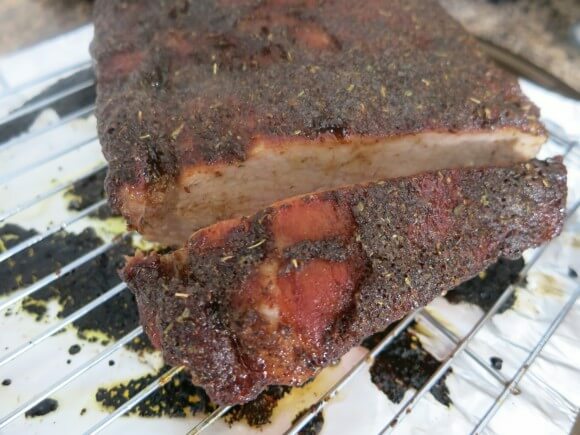 The flavors all melded together into a great rub, which completely coated the pork lion, creating a nice crust that didn’t have too much smoke or spice, as the brown sugar tempers it. The inside stayed tender and juicy, which is always good. 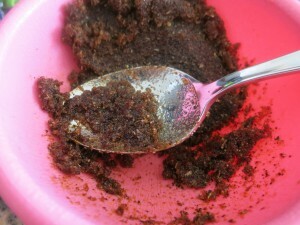 Combine all spices in a small bowl. Add olive oil, and stir to combine. This will result in a thick, spreadable texture. Let it sit for 15 minutes. Cover a baking pan with tin foil and then place a wire rack on top. Rest pork loin on rack. Completely cover the loin with the spice rub, making sure to get the sides. Place in oven and cook for 1 to 1.5 hours, depending on size of your loin. (I’m going to admit, that made me giggle). If you have a thermometer, temp should be between 145 and 150. Let sit for 10-15 minutes so the juices have time to rest, then slice and enjoy!